Confession time: I have not finished Kingdoms of Amalur: Reckoning. Over the last several days, I've poured over thirty hours into the enormous world. After twenty or so, I resolved to avoid secondary tasks and focus on primary quests, hoping to finish the campaign before composing this review. And then, after reaching a milestone in the story, it occurred to me: I don't want to do that. Please understand, I have no desire to ruin this review for our readers. It's just that I don't want to ruin the game for me. To plow through Reckoning with no regard for the enormous array of tasks and quests, to ignore its hidden secrets, is a disservice to its lovingly crafted world. That love is evident from the moment your character emerges from the first dungeon into the light of day, escaping from the murk into a world of fantastic, vibrant beauty. Landscapes are bright and colorful, spanning golden and green forests to arid deserts and mountains that saw at the sky. Cities are gigantic, sprawling places with a sense of scale so vast as to make your character insignificant. Upon seeing a city or castle in the distance, you may find yourself uttering a few involuntary "oohs" and "ahs." I did. Every locale has its people, be they gnomes, humans, elves or the magical Fae. Bound to an eternal cycle of life, death and resurrection, the Fae are central to the tale. Seers of fate, the Fae know all creatures are bound to a predetermined destiny. Except for you, that is. Brought back from death by a feat of science, your character is no longer bound to fate and is, instead, able to change it. It turns out this makes you the perfect recruit for the war against the Tuatha, a splinter of the Fae people beholden to a new god and determined to break loose from the cycle of fate and claim all of Amalur for their own. It sounds like heavy stuff, but in practice our hero's fate-changing abilities boil down to something far simpler: taking on quests and gaining new skills. 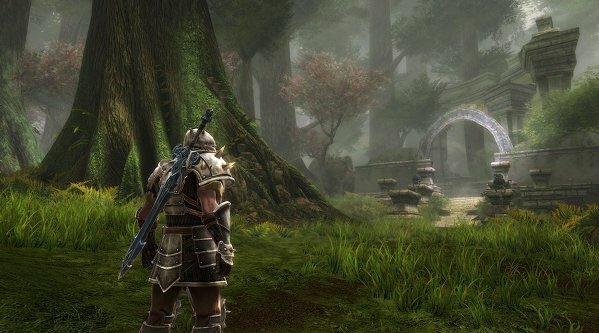 The world of Amalur is bristling with quests. While wandering about to finish a main quest, you will undoubtedly encounter a village on the way. Villagers, naturally, will ask your help slaying beasties or recovering items from caves. Should you make for said cave, you will meet a weary traveler with yet another quest. Tasks tend to follow the tropes established in other open-world titles: Fetch this item from that dungeon; please kill this many monsters; find this lost loved one (who, of course, doesn't want to be found). Still, the plight of certain characters or the allure of certain scenarios will undoubtedly pull you from more important matters. While not all quests bestow exciting rewards (more gold? Gee, thanks) the world is so littered with loot and goodies that almost every journey is worth the effort. I strongly recommend investing in the Detect Hidden skill if you enjoy finding secret doors and treasure caches. Even if a quest fails to pan out, the combat handily makes up for it. Each class of abilities offers a different experience, but all offer a thrill that isn't often found in an open-world role-playing game. Having invested heavily in sorcery, my hero will pull enemies close, roast them with a gout of flame, leap to a safe distance and then summon an ice boulder that crashes down upon them. To cap things off, he calls a massive meteor down from the sky, splashing down in a blazing show of pyrotechnics. This particular chain of events has become commonplace for me, but I must confess that every single time it happens, I giggle. What's remarkable is that my character has spent most of his time in Amalur as a rogue, dealing more in daggers and poisons than staves and magic. Thanks to our hero's fateless nature, however, he can unbind his destiny at any time -- for a fee -- allowing players to reinvest points as they see fit. In theory, one could mix and match abilities from the Might, Finesse and Sorcery trees, but the most powerful techniques (like the aforementioned meteor) require dedicated investment. Still, at any given time you can go from rogue to sorcerer to warrior and back again, which not only helps players find their niche but keeps things fresh. All that doesn't even touch on Reckoning mode, which gives players a brief boost in attack power and allows them to potentially double the experience earned in any fight. Reckoning can only be activated after filling a special meter, so learning when to save it and when to use it becomes a game in itself. Interwoven with quests and combat is a whole other layer of peripheral systems, ranging from Stealth to Alchemy, Blacksmithing, Sagecrafting and more. In other words, if you're not too busy completing quests and slaying trolls, why not make some better weapons, and be sure to craft some gems to enhance them? You say your blacksmithing and gem crafting aren't up to snuff? No problem, just brew up a couple of potions to temporarily enhance those skills. None of this is to say there aren't a handful of minor concerns with Reckoning, but they are just that -- minor. Quests can become repetitive, though nearly all of them are optional. Some skills seem unnecessary, especially lock picking. Any lock can be picked, even at the lowest skill level, as long as you have enough picks. I should also mention that a friendly character managed to trap me in the corner of a dungeon, forcing me to reload a previous save. You'd think any non-player character would get out of the way when pushed, but no. Perhaps it will be fixed in a later patch but, for now, keep your distance from friendlies in close quarters. Again, though, these are tiny quibbles in an otherwise sterling production. Kingdoms of Amalur: Reckoning presents a world that is immaculately crafted and beautiful, yet still simple and accessible. Every corner reveals a person in need, a treasure to collect, a secret to uncover, a battle to wage. I don't know how much more time I'll spend in Amalur (dozens of hours? hundreds? ), but I plan on savoring every minute. 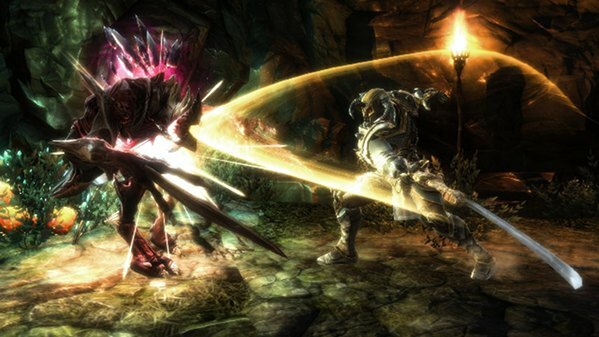 This review is based on a retail copy of the Xbox 360 version of Kingdoms of Amalur: Reckoning, provided by Electronic Arts.